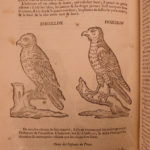 Louis Liger was a prominent 17th-century French writer known for his works on flora and fauna. 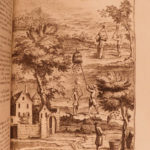 He is chiefly remembered for his major work ‘Nouvelle Maison Rustique,’ or ‘The New Rustic House.’ Originally titled ‘General Economics of Country Goods,’ this work went through dozens of editions and reissues following its initial release in 1700. This work covers all aspects of rural life in an encyclopedic form including hunting, gardening, fishing, falconry, wine and beer making, cooking, and bee keeping. This two-volume sixth edition is filled with 34 fascinating full-page and folding plates as well as 30 in-text woodcut engravings. The 5th-10th editions of ‘Maison Rustique’ were edited by Henri Besnier. Paris : Chez Saugrain fils, 1749.